Thank you for your interest in volunteering at the Capital City Film Festival! Volunteers are a crucial part to the success of CCFF. 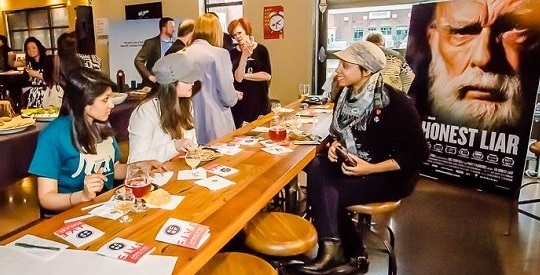 Volunteers are the face of the festival and will often be the first (and sometimes only) person to interact with patrons. You are so important! Outlined below are volunteer job descriptions as well as other important FAQ information that will assist you in being a CCFF rockstar. Absolutely! Let’s chat more. Email Volunteer Coordinator Jill Rinckey at jill@capitalcityfilmfest.com. IS THERE AN ORIENTATION FOR VOLUNTEERS? Yes, but if you missed the 2019 orientation dates (March 31st and April 4th), no worries at all. We’ll fill you in on any crucial details. Get signed up right here for a shift and if you have any questions, contact jill@capitalcityfilmfest.com. Exact assignments will be giving upon arrival at the venue at the start of your shift. Ticketing & Pass Check-In: Volunteers will sell passes and individual movie tickets to people who come in the door. Volunteers will also check in those who have pre-purchased tickets and passes. Information Table: Volunteers will be seated at the main entrance and will be the first to greet patrons. Some responsibilities will include advising festival-goers about the schedule, answering questions about the festival, selling merchandise, and offering other information as requested. Ushers: Some festival events will require ushers to help seat patrons. Ushers may also provide general festival information. Line Management/Crowd Control: Volunteers will work in the venue lobbies to manage any lines that may form and help people with any questions. Setup & Teardown Champions: Volunteers will help with the setup and the cleanup of venues, getting them ready for the next event. This involves a range of duties including carrying boxes, tidying up tables and chairs, etc. Some of these shifts may be later in the night. Concessions: Volunteers will bring smiles to faces with concession offerings! Some responsibilities may include sales of food and beverage, cleanup/setup, taking inventory, and smelling popcorn. Be prepared for more standing than sitting. (Please note that alcoholic beverages will be available to attendees at most festival events). Yes. You must be 16 years of age or older to volunteer. Volunteers under 18 must have written permission of a parent or guardian, and job options may be limited. Wear comfortable, presentable clothing. Khaki shorts, pants, skirts, jeans with no holes, and capris are perfectly acceptable apparel for the event. You are not required to wear your free CCFF t-shirt that we give you. You will wear a lanyard during your shift that designates you as a volunteer. Keep in mind that you may be on your feet during your shift, so make sure you select shoes that are comfortable. You may bring your own water, juice, or other non-alcoholic beverages with you, however, most venues will have concession items for sale. We cannot guarantee a secure area for you to store personal belongings, so do not bring any valuables or large or bulky items. You should plan to bring only what you can fit in your pockets and/or a small bag. Cell phones and electronic devices must be turned off or silenced during film screenings. The festival’s success depends on volunteers! To be courteous to other volunteers, we ask that you arrive ON TIME for your shift(s). If you can’t make it to your committed shift for any reason, please email CCFF Coordinator Jill Rinckey as soon as possible at jill@capitalcityfilmfest.com.